According to a survey by HomeAway, owners that respond within the first three hours of receiving an inquiry are about 2.5 times more likely to get the booking than those that wait 24 hours or more. If you provide your home number in your rental listings, then when you are out, you'll be left calling to check your voicemail frequently. But if you provide a cell phone number, that may not be the most convenient for you at all times. In the NC High Country, where we spend a lot of time, there are many places with poor cell phone reception - especially for AT&T. We also spend a couple of weeks most years in England. And then on top of this we happen to be living in Canada for a year currently. All of these things would have made it inconvenient (and expensive) if we had been using our cell phone number. What we decided to do is register for a new number with Google Voice and use this as our Vacation Rental contact number. It is a free service from Google that lets you pick a phone number of your choice, or for a small fee you can transfer a pre-existing number to it. You can then configure Google Voice so that when someone dials this one number, it rings through to your home, cell phone and office. Google Voice has a lot of other features too. You can setup groups of different caller phone numbers, and configure so that different groups are routed to different phones at different times of day. You can also have different voicemail messages for different groups. You could even setup your current guests as their own group and setup a unique message for them. 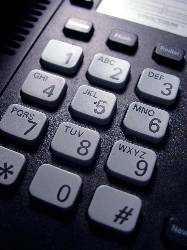 In addition, voicemails are automatically transcribed, and can be setup to be emailed to you. Text messages can be emailed to you too. Lastly the service lets you send text messages to cell phones in the US or Canada for free, from a browser (or your phone) wherever you are in the world. Once you start to include your phone number on listings, notices in your vacation rental, and emails to guests, it's going to be inconvenient to change it. Do yourself a favor and setup Google Voice and start using it as your vacation rental contact number from the beginning.